I have decided that I don’t really like the pyramids. But, then, perhaps I am not sophisticated enough to understand the artistic intent. I am wondering why Pei chose to use a pyramid. I suppose I can understand why as far as practical reasons go. However, aesthetically, it really looks out of place. What are your thoughts? 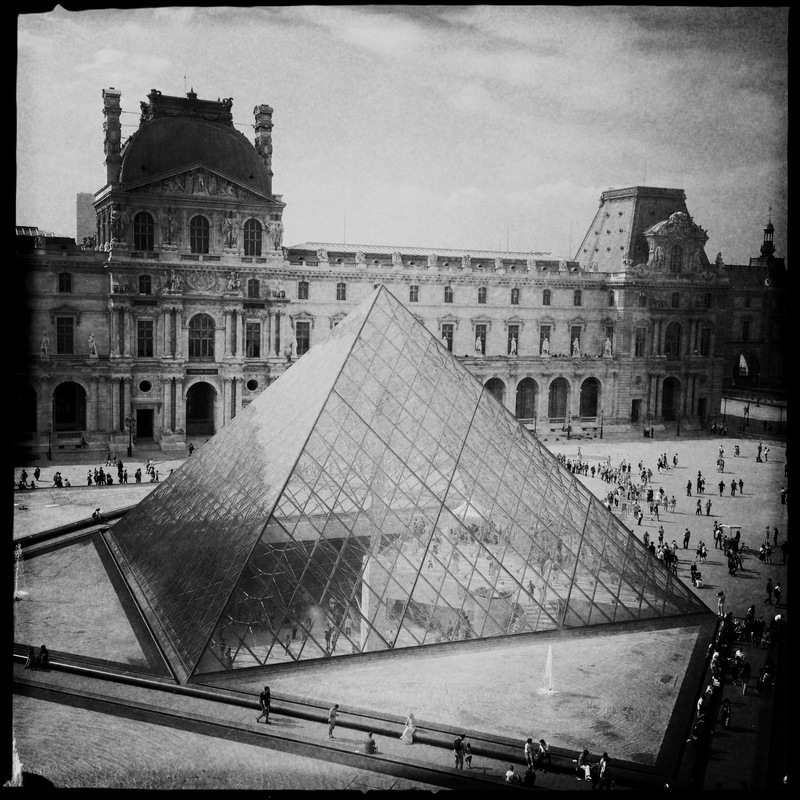 When we wandered out the Louvre, both times, I was totally shocked by the Apple Store in the Carrousel (the shopping mall that you walk through as you exit). It was totally surreal to wander around in this place with so much, mind-blowingly so, history and be confronted with something so American and representative of the present time. I was so shocked by this that I completely missed La Pyramide Inversée (featured prominently in The DiVinci Code). I wandered by this thing twice and don’t have any recollection of it. The evening of the third day we were in Paris, Raf and I wanted to take a stroll down the river. We walked down the ancient stairs to the riverbank, and noticed that there was quite a crowd of young people hanging out down there. It was really cool. Some of them were in groups, some of them coupled. All of them drinking either beer or wine. Some were chatting with each other, others were reading. Most of them were enjoying the scenery. Everyone was having a nice time. We had a seat and soaked it all in. To our right somebody started playing guitar and singing a Bob Marley song, “No Woman No Cry.” Then they played something with more punch and a couple got up and started dancing. I was all, “if ever there was a moment to snap a photo, this would be it.” So I did. I have been up since 3:45 this morning. This jet lag thing is a real drag. Needless to say, I am exhausted. I have spent the day doing laundry and looking at photos from my trip, wishing I was still there. Here is a shot from the top floor of Musee d’Orsay. I am on my way back home to Sandy, sitting in the Philadelphia airport. I had such a fantastic time. One of the highlights of my life. A trip I will remember for the rest of my life. Now I need to go back because there is so much that I missed! I will post more photos and try to post stories in the coming week. One thing about Paris that was really cool was the graffiti. There is lots of really cool street art all over the place. Rafael knew about most of it. It was fun find it scattered all throughout the city. 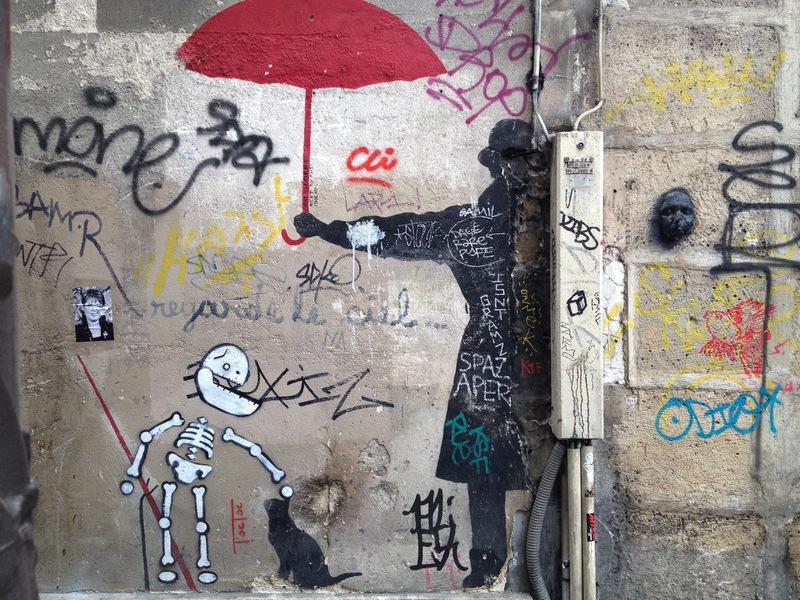 We think this might be Banksy and I think we also saw a Banksy piece at Notre Dame. Our original plan was to go to Versailles today be we nixed that idea to, instead, go back to the Louvre and the Musée d’Orsay. It was a hard decision but we really felt like we needed to take in more of the museum Mecca. We had a guide book with us that had a tour of the super famous works and I am so glad we had this. We missed so much the first day because we wandered around. It was nice to have more focus today. I saw Venus de Milo! Among a whole bunch of other famous things. I am stoked. I mentioned that we also visited the Musée d’Orsay. we wanted to find a Manet painting, (Olympia) we missed yesterday (found it!). We looked for the photography collection but never found it. Finally, with very tired feet, we trekked over to Champs-Élysées and snapped a photo of The Arc de Triomphe. I think I could’ve lived my life without visiting this street. Not really my thing. There were people standing in line to shop at Abercrombie and Fitch. I so did not get it. At all. Tomorrow we go home and I am sad. I had the best time.